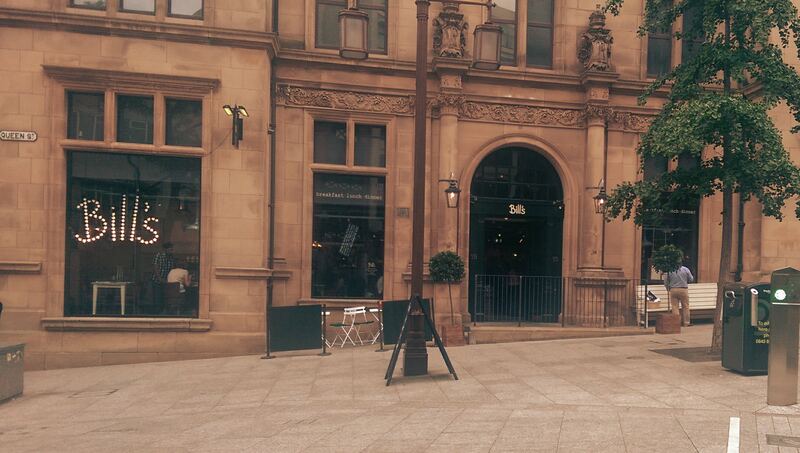 In the peripheral vision of the indomitable Brian Clough sits the latest restaurant to hit Nottingham city centre. I find it difficult to succinctly describe Bill’s, whilst in part down to my lexicon and tendency for the verbose, I am not sure if Bill’s knows what it is. On entrance you are greeted by a series of conserves and confectionary, understandable at Carluccio’s or Jamie’s with their brand pull but not what I expected here. The dining area is kitted out with exposed brickwork with numerous brushed steel vents and pipes and tables are deliberately quaint and ramshackle. I had seen from some twitter PR that they do cocktails, but with only 6 options it’s hardly a well-stocked bar. So it must be a restaurant right? Staff were numerous and keen. The restaurant had only opened the week before so whilst you can’t expect it to run like clockwork I was a little concerned to have to take matters into my own hands to secure a menu each. It would appear a significant amount of their training had been devoted to up selling as extras were pushed throughout the meal. The menu is modern European and if I had to be pushed to describe Bill’s I would suggest “a urban Browns”. 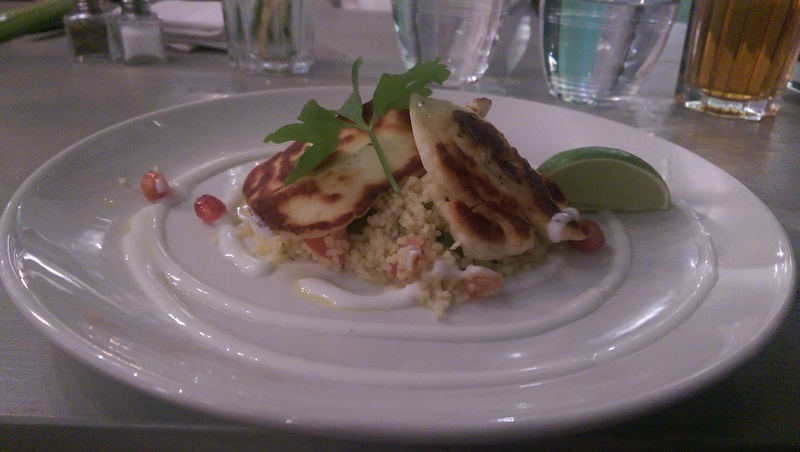 Starters are £5/6, and whilst modestly priced my halloumi failed to impress. Perfectly edible but paired with lifeless; under seasoned cous cous and plain yogurt it was bland on a plate. I had higher hopes for the main course. Burgers are £10 (inc. Fries) with steaks up to £18.50. 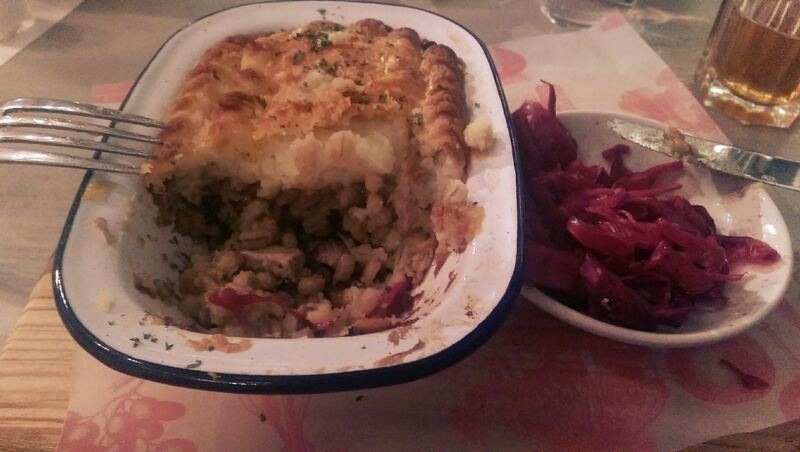 I rallied against seasonal eating having chosen a hearty duck pie with red cabbage, £12. 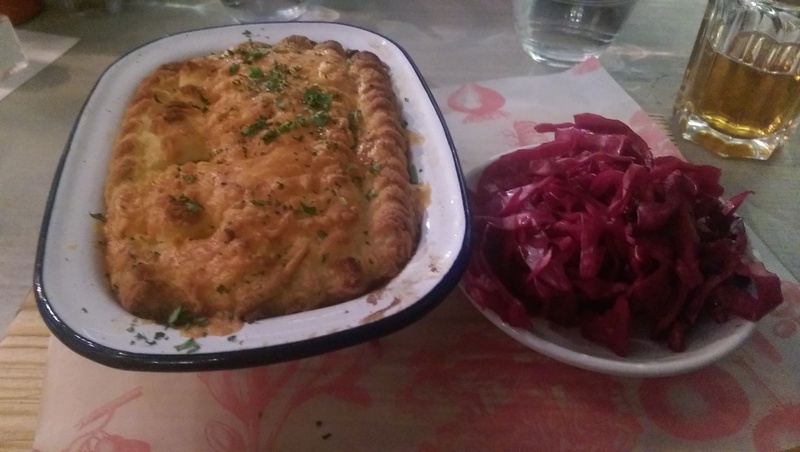 Things started well, the pie was topped with mash folded with smoked cheddar, as tasty a pie topping as I have ever had. What lay beneath was chunks of duck leg with a good gamey flavour as one would expect. Sadly that is as far as the success went. The menu had promised “rich gravy”, in reality the Sahara, open-lidded, duck pie would have delivered more moisture than Bill’s. Following my trial in the desert, I feared for trial by dessert. I had been eyeing warm pecan pie since I saw the menu online so I decide to make the plunge. A choice well made as this was comfortably the best course of the evening. The syrupy filling was just the right amount to keep the pie moist, the pastry had been well made and the banana ice cream worked well. Whilst dessert was excellent it wasn’t quite enough to save the rest of the meal. The menu was promising and there is a little more encouragement with Bill’s than recent visits to Browns. 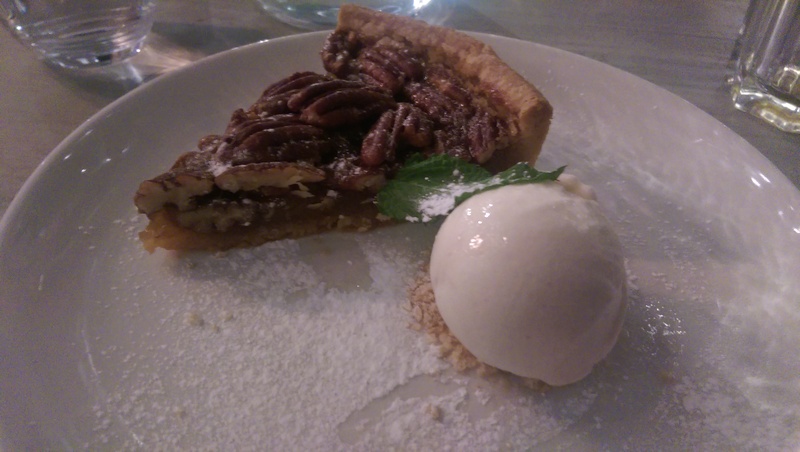 Pecan pie aside though, I won’t be rushing back. If I want a burger or steak I’ll visit Annie’s or Larder on Goosegate respectively which are at the same price point. I don’t see what Bill’s brings to Nottingham that we don’t already have. I decided to give Bill’s a try this weekend, knowing that your review would be appearing. If restaurants could copyright their interiors, waiting style, menus and general vibe, Jamie’s Italian would have the lawyers swarming all over Bill’s (and presumably they would be asked to change the name too). This would be fine if Bill’s had taken the good bits and learnt from the mistakes of Jamie’s but sadly it was almost like déjà vu in the errors department. Thankfully I suspected this would be the case from taking two steps in and we only had drinks and not food. As we sat down, three people opposite were being served. Two burgers arrived with those annoying metal buckets of chips which are a) naff and b) simply conduct the heat away from the chips. The third person’s dish was cold, and went back. Not a good sign, when the restaurant was fairly empty. We order a tempranillo and a cappuccino. We got a glass of white wine (exactly) and what I can only describe as a cup of hot water that tasted of nescafe but with a weird, grey colour, topped by thee millimetres of creamy foam. In other words, two drinks completely different to what was requested. We then ‘enjoyed’ our drinks (the wine got changed, by the way) with the thoroughly annoying experience of having the waiter (in trendy trainers) appearing at my shoulder every other minute, hopping around like a wasp on a sandwich, never quite settling for long enough to do anything that makes you think it might have a useful purpose, but never doing the decent thing and going away. Surrounded by jars of Bill’s jam (£3.95) and Bill’s buttons (£3.95 for a small plastic bag of coloured chocolate), to be presented with a bill for £7.80 plus 78p service charge (allegedly optional, in the way that you have to ask for it to be taken off) I resolved never to return. And I won’t. I visited Bill’s on Friday and had a similar opinion! I went for the veggie (halloumi) burger and a chocolate brownie and both were lacklustre. They need to get to grips with things quickly. I agree with everything that has already been said. The burger was pappy and tasteless,and as for the little bucket of chips. Over priced,and like you said,bringing nothing new to Nottingham. Love the term pappy Tim, I must use it more often! My lemon drizzle cake was cause to contact trading standards. The cake itself had only a hint of lemon and no such drizzle. I left there very disapointed and the portion sizes were shockingly small too. It all looked nice on the plate but that won’t get me back there. Here’s another reason to contact trading standards – they state on their menu that they serve their pancakes with maple syrup. It’s not, it’s golden syrup in ‘maple flavour’. Tells you everything you need to know about the place.